This case study follows a kohaku from the May '14 spawning; a koi I've kept for it's development interest. 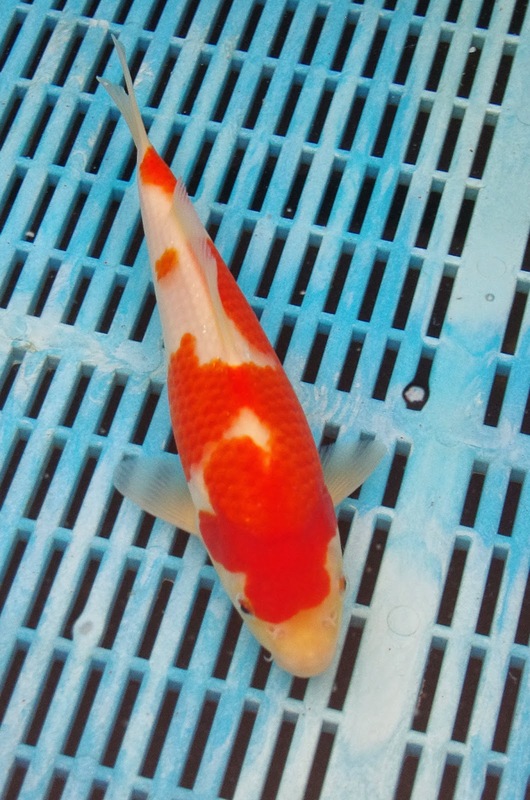 It's a koi that I kept at the last selection and the main interests are the red and white colour, the shape of the pattern, and the skin quality. This koi stood out early on for being the most shinny, and for having a red that appeared extremely thick and with neat edges very early on. You can see those traits to a certain extent in the picture. Note the shine line along the dorsal, and you'll have to take my word for it - the red and white stood out compared to it's peers at this stage. 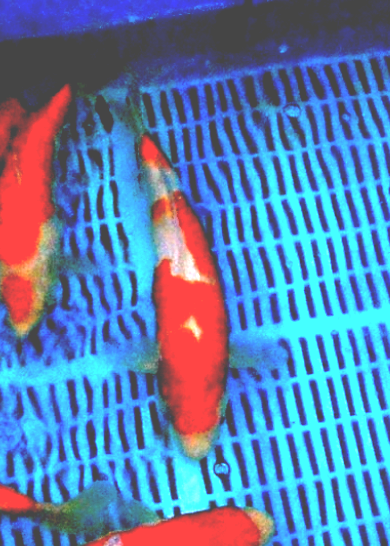 In a bowl of around 100 koi, it literally shone out and you could identify it just by it's shine. I don't have measurements from that selection to objectively state where it stood size wise in the spawning, but I remember it to be in the middle order - no where near the largest ones but it still had some volume and clearly larger than the smallest ones. I can show you how the red pattern developed over the next few photos. Keep your eye on the white patch (almost a window in the 8th Aug 14 pic) that's on the shoulder area of the koi. And also watch the nose pattern. Appologies for the 7th Feb '15 pic - it was dusk and I ran out of light at the end of selections. 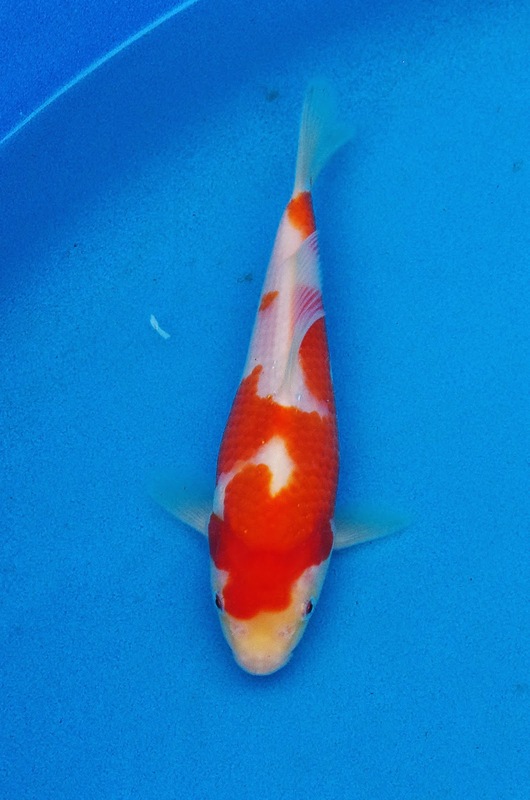 I've adjusted the brighness in the photo so you can see the koi, and that helps us observe the shape of the red pattern marking on the shoulder area. 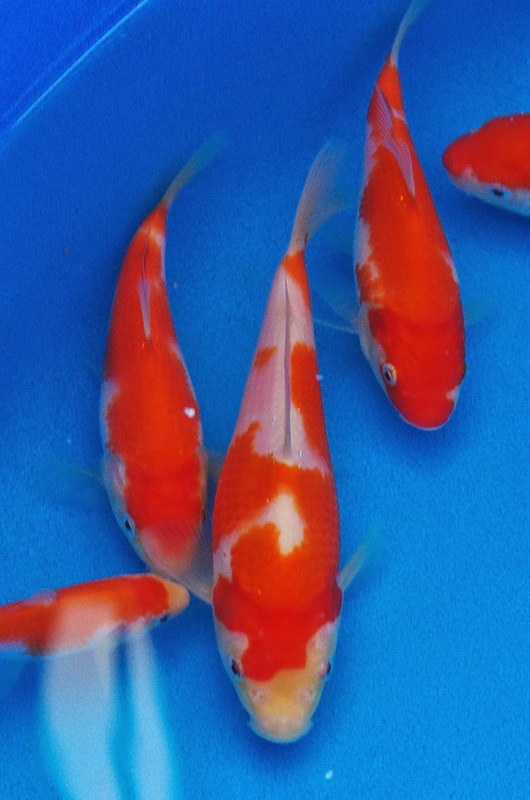 So overall, the trend has been for the red pattern marking on the shoulder to expand and fill in the white area, eventually closing the white gap running down the side of the koi and forming the white window. 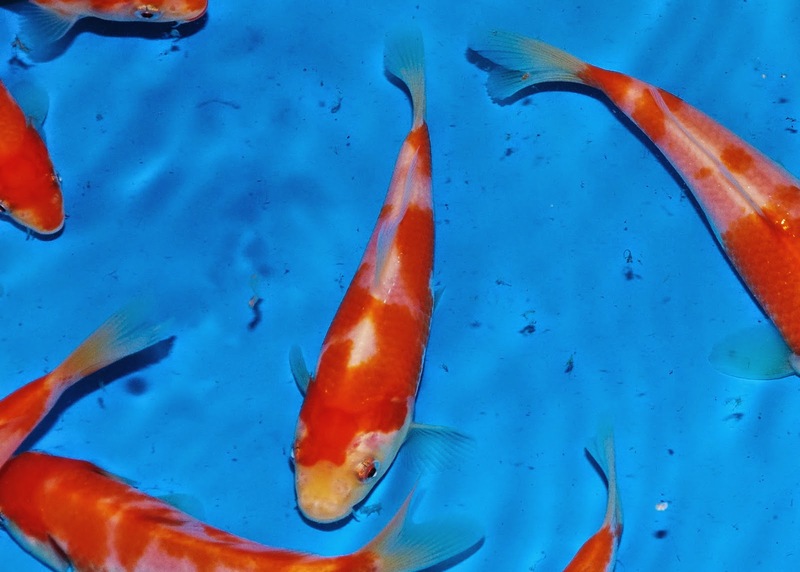 I'll take clear photos of this koi at the next selection so we can gleam more from it's development and check on the red and white, and how it compares to it's peers.